Background: Inguinal hernia is a good indication for laparoscopic surgery. Recently,single-site laparoscopic surgery is widespread, especially for cholecystectomy, oophorectomy and appendectomy. 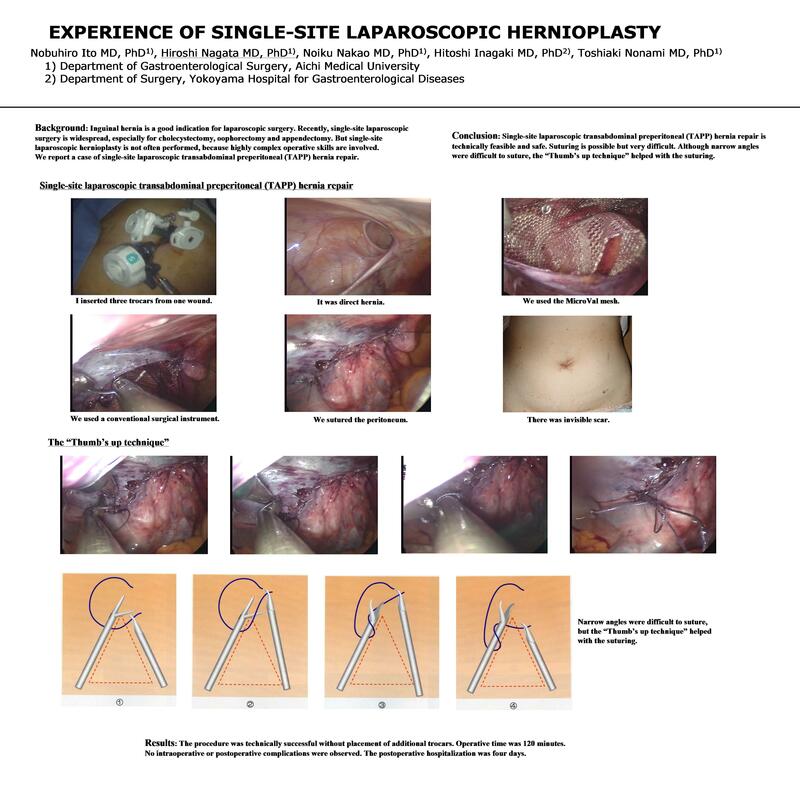 But single-site laparoscopic hernioplasty is not often performed, because highly complex operative skills are involved. We report a case of single-site laparoscopic transabdominal preperitoneal (TAPP) hernia repair. Method: A 58-year-old woman with symptomatic left inguinal hernia underwent single-site laparoscopic transabdominal preperitoneal (TAPP) hernia repair. We used a so-called parallel method with a conventional surgical instrument. The operation was done by the conventional TAPP method with MicroVal® mesh. The peritoneum was closed with an intracorporeal running suture. Results: The procedure was technically successful without placement of additional trocars. Operative time was 120 minutes. No intraoperative or postoperative complications were observed. The postoperative hospitalization was four days. Conclusion: Single-site laparoscopic transabdominal preperitoneal (TAPP) hernia repair is technically feasible and safe. Suturing is possible but very difficult. Although narrow angles were difficult to suture, the “Thumb up technique” helped with the suturing.